By posting your lesson to a Clarify-it.com account you will get HTML back that you can embed in a forum post, wiki, project management application or any other web application that accepts HTML. Before you follow the steps in this lesson you must create a Clarify-it.com account. 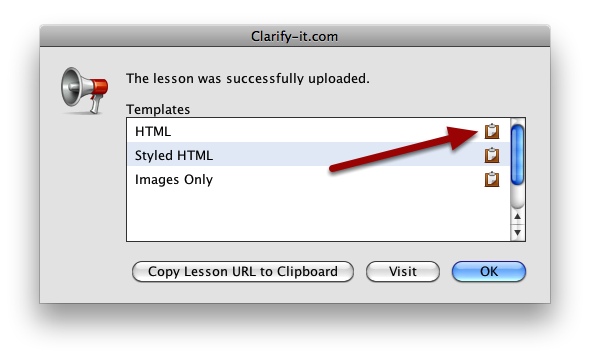 Your lesson will be uploaded to Clarify-it.com. 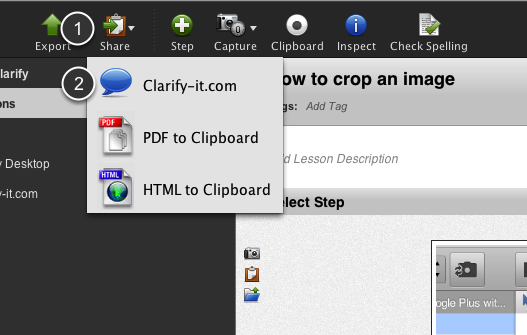 After you lesson is uploaded you will see a dialog box with several items you can copy to your clipboard. Click the HTML clipboard icon and paste the HTML into your forum post or web application. The HTML template will give you un-styled HTML. The Styled HTML template has some basic inline styling applied to the HTML.